Colleen and Danny find themselves connected to some very interesting comic book characters by the end of Iron Fist’s second season. The second season of Iron Fist is a serviceable improvement over its wildly uneven first season, but it’s brought to another level in its final episodes with some truly surprising connections to the comics. Two names, in particular, have got comics fans talking—so here’s everything you need to know. Of the multiple comics characters introduced in the second season of Iron Fist, there are two in particular that tie into one of the best Iron Fist comic runs in recent history: Matt Fraction, Ed Brubaker, David Aja, and Travel Foreman’s The Immortal Iron Fist, which ran between 2006 and 2009. 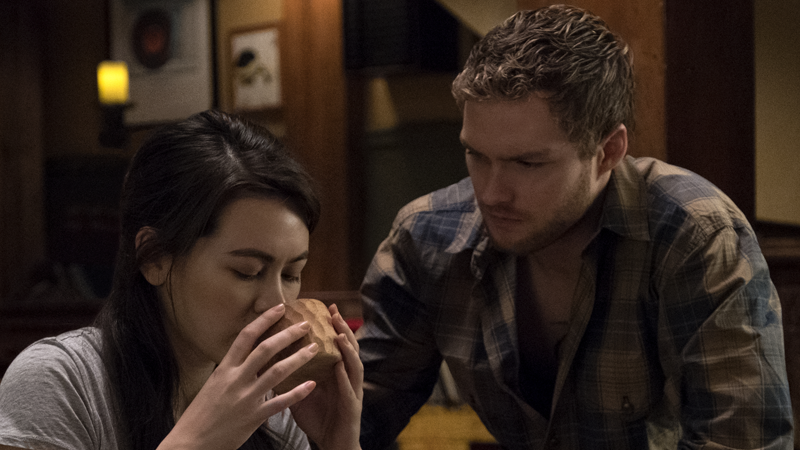 These characters—Orson Randall and Wu Ao-Shi (referred to by her more fanciful title in the show as “The Pirate Queen of Pinghai Bay”)—set up some huge new character arcs for Danny Rand and Colleen Wing to explore in season three. They hail from the first half of Immortal Iron Fist’s run, which saw Danny uncover the true legacy of the Iron Fists who came before him as he balanced participating in a celestial tournament between K’un-Lun’s sister cities (and their respective living weapons) known as the Tournament of Champions with an existential threat to the Rand Corporation from none other than Hydra itself. Both Orson Randall and Wu Ao-Shi were explored as important facets in the long history of the Iron Fist as a mantle in the comics. Orson, named dropped in the show as the man who gives Danny details about the preserved corpse of a previous Iron Fist in the season’s final episodes, was the direct predecessor to Danny as the wielder of Shou-Lao’s Iron Fist powers. Wu, meanwhile—teased throughout the season as the protagonist of a fanciful tale Colleen’s mother told her as a child, only to be eventually revealed as a direct ancestor of Colleen and a former Iron Fist after Colleen herself is given the power by Danny—holds the intriguing legacy in the comics of being the first woman to claim Shou-Lao’s power. Want to know more? Here’s their own origin stories. Randall witnesses the brutality of war first hand. Given the weird time distillation of comics (in Immortal Iron Fist, Danny is in his early 30s, despite having appeared in Iron Fist comics for nearly 40 years before that series), just how long Orson Randall lived is up in the air. We do know he was born in K’un-Lun in the late 19th century, after his parents’ airship crash-landed in the city during one of its emergences into Earth’s plane of existence, as it is wont to do every decade or so. Taken in by Lei-Kung the Thunderer, just as Danny would go on to be, Randall was trained to one day take on the challenge and face Shou-Lao, which he did successfully to become K’un-Lun’s latest living weapon. Like many Iron Fists before him, Randall ventured beyond the timeless limits of K’un-Lun and returned to Earth, but he did so at a crucial turning point in history: during World War I.
Randall fought in the trenches during the bloodiest battles of the war (when he wasn’t part of a period supergroup known as the Freedom’s Five, where he battled...the Martians from War of the Worlds? ), and the countless horrors he witnessed firsthand broke him. In the early ‘30s, when the Tournament of Champions prior to the one Danny was due to participate in was called, Orson refused to fight, changed by his role in the Great War. After accidentally killing one of his fellow living weapons during an attempt to force him to participate, Orson fled. He was disavowed by K’un-Lun and turned to a life of opium addiction, choosing to live out his days in drug-induced stupors to try and forget his past. After Lei-Kung tracked him down and discovered the state Orson was in, he took pity on the Iron Fist and reported him as dead, leaving the chance for a new champion to confront Shou-Lao (it turns out that multiple Iron Fists can exist at the same time—but there is a blinding, almost fatal level of pain in both users wielding the fist within proximity of each other, which is why Danny managed to wield it just fine with Orson still alive). In the time between his stupors and meeting his successor as the Iron Fist, Orson actually trained Danny’s father, Wendell Rand, in martial arts, before Wendell, inspired by Orson’s stories, sought out K’un-Lun to become a champion there. Despite going through rigorous training and tournaments to earn the honor to fight Shou-Lao, Wendell declined—crippled by self-doubt after Orson spent years telling him that the power of the Iron Fist was a curse not worth chasing. Instead, Wendell returned to Earth, becoming the head of the Rand Corporation. 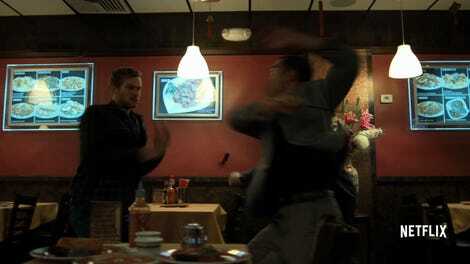 Orson introduces the concept of chi-infused weaponry to Danny. Wu takes the bay for her own. Wu Ao-Shi doesn’t have as much history in the comics as Orson does, but her role as the first female Iron Fist has important ties to Colleen taking the mantle on in the show beyond the fact Wu and Colleen have been given a direct lineage. Covered primarily in a standalone issue of Immortal Iron Fist, Wu operated as the Iron Fist in the 16th century. A native of K’un-Lun, Wu was an orphan taken in by Lei-Kung after witnessing the young girl deliver brutal blows to a merchant she was trying to steal food from. After years of training to hone her strength and discipline, Wu earned the right to face Shou-Lao and imprint his mark on her body during battle, becoming the first woman to become an Iron Fist in K’un-Lun’s history. But during that process, Wu fell in love with a local fisherman, and eventually married him. As her power from the Iron Fist grew, her husband’s anxiety about the wildly different lives they led did too, leading to him leaving the city and his wife. Despite protests, Wu left K’un-Lun in search of him, using her powers to become a mercenary to fund both her own survival and continue her quest to find her husband...eventually bringing her to Pinghai Bay, a territory recently invaded by pirates. Wu channels her chi into a flurry of fiery arrow volleys. Discovering her husband was held captive there, Wu liberated Pinghai Bay from the pirate overlords singlehandedly, taking the region for her own to safeguard it—and in doing so forged a new ability with her Iron Fist powers. She channeled her chi energies not through her fist but instead into arrows, creating flaming bolts of energy that never missed their marks. After freeing Pinghai Bay and reuniting with her husband, Wu lived out the rest of her days as the Bay’s benevolent leader, raising a family. But her technique of channeling Shou-Lao’s energies into her weaponry would live on in the stories of the Iron Fist, not only inspiring Orson’s use of pistols in the comics, but something that’s seemingly going to come up in the show too. After all, Colleen is a descendant of Wu in the TV series, and she also lights up her Katana with chi in the final scenes of season two—unconsciously invoking the ability introduced by her ancestor.